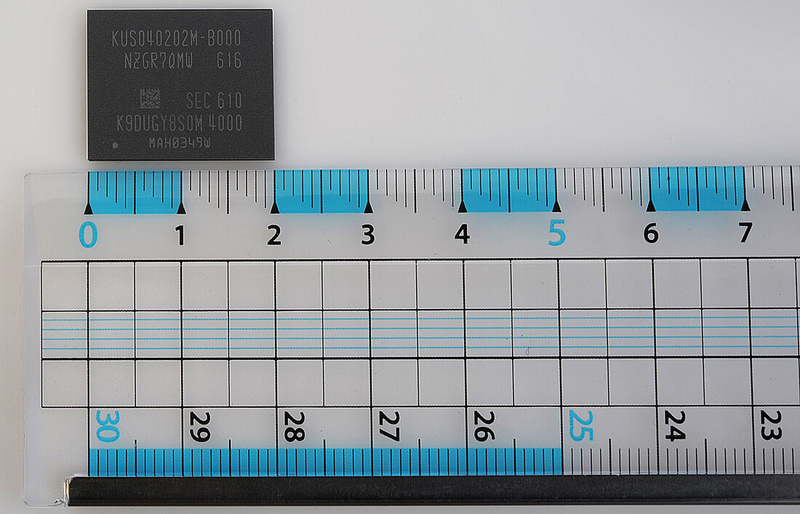 Samsung is now mass producing an impossibly tiny solid state drive for use in ultraportable notebooks and next-generation PCs. The PM971-NVMe is the industry’s first NVMe PCIe SSD in a single ball grid array (BGA) package. It was created by combining 16 of Samsung’s 48-layer 256-gigabit (Gb) V-NAND flash chips, one 20-nanometer 4Gb LPDDR4 mobile DRAM chip and a high-performance controller. Jung-bae Lee, senior vice president of memory product planning & application engineering team at Samsung Electronics, said the new BGA NVMe SSD triples the performance of a typical SATA SSD with capacities of up to 512GB. The drive-on-a-chip is capable of sequential read and write speeds of up to 1,500MB/s (megabytes per second) and 900MB/s respectively, when TurboWrite technology is used. Random read and write IOPS (input output operations per second), meanwhile, check in at up to 190,000 and 150,000, respectively. Even more impressive, however, is its size. The SSD measures 20mm x 16mm x 1.5mm (smaller than a postage stamp) and weighs roughly one gram. In comparison, a new penny weighs 2.5 grams. Its volume, Samsung says, is approximately a hundredth of a 2.5-inch SSD or HDD and its surface area is about a fifth of an M.2 SSD. Samsung’s new PM971-NVMe SSD will be available in 128GB, 256GB and 512GB storage options. Samsung said it’ll be providing parts to customers this month.